If you’re reading this, you’re likely experiencing symptoms of burnout. You know, the usual suspects—trouble sleeping, lack of energy, difficulty concentrating, etc. Burnout is something people all across the workforce are experiencing, and it’s time to do something about it. If you’re tired of feeling drained and want purpose and happiness back into your life, this is for you. We’re diving into why should you care about your self-care routine as well as how you can implement self-care into your everyday life. Why is it important to talk about and implement self-care? Self-care is a hot topic these days, as it should be. Hustle culture has dominated the entrepreneurial realm, telling us that if we’re not working 12 hour days, every day, we’re failing and are terrible business owners. This culture created around the premise that working long days with little to no rest is something that should be glorified and sought out is doing more harm than good. As a result, burnout happens. As a freelancer, it can be difficult to put boundaries up between your work and your personal life. But to continue to create, write, produce, or grow, you need to make TLC a regular item on your to-do list. This may sound a little bizarre, but hear us out. Your calendar is littered with important things, like meetings, webinars, product launches, and deadlines. So why not schedule a time to exercise—or any other self-care activity—into your calendar, too? We’ve all been there; you’re going on about your day with every intention to work out or meditate after you check the remaining items off your to-do list. Only once you do finish everything you need to do, the thought of doing anything other than relaxing on the couch—let alone exercising—sounds terrible. The remedy? Block out time in your schedule and get it done. Whether it’s a 30-minute walk around the block at lunchtime or attending a morning spin class before you boot up your computer, make it a priority. You don’t have to do an intense Tabata workout every day, but sitting at your desk for long hours at a time is not good for your health. Of course, things are bound to pop-up and require flexibility. But honoring your promise to take time for yourself despite the crazy is essential. Remember: You’re not a slacker for wanting to take a break and go outside or read a few chapters of a book on your couch. After all, if you don’t take care of yourself, it’ll be difficult for you to produce your best work. There isn’t a one-size-fits-all plan when it comes to self-care. Things that might be feasible for some may not be doable for others due to schedule conflicts and what self-care looks like for you. If you’re a parent and spend your mornings getting your children ready for the day before jumping into work, an early morning workout may not work for your schedule. Or if you volunteer during certain hours, you may have to create a self-care routine based around that time. Scheduling matters aside, not everyone’s idea of self-care is the same. For some people, self-care may be taking a candlelit bubble bath and getting lost in a good book. For others, it may be getting happy hour drinks with friends you barely get to see or going out to dinner with your significant other. Not sure what self-care looks like for you? Self-care means doing the things that recharge your batteries, whatever that may be, and often. If you do the things you like to do, you’re more likely to make time for them. Did you know that 80% of smartphone users check their phones within one hour of waking up or going to sleep? And of that, 35% of users check their phones within the first five minutes. There’s no other way to put it: We are addicted to our phones. From watching the endless stream of Instagram Stories to mindlessly scrolling through Twitter, for many, our phones have become another appendage. Many solutions exist that can help reduce the amount of time we spend on our phones, but a great place to start is to change your notification settings. Think about how many notifications you get per hour. Are they all pressing and in need of your immediate attention? Probably not. Turn off notifications for social media like likes, comments, and shares, and you’re sure to see a break in how much time you spend checking your phone. Also, turn off notifications for other non-essential apps and see if that helps you cut back on your phone usage. It may surprise you when you see just how little you’re missing out on. Saying no to plans, to work opportunities, and everything in between can be a difficult thing. However, there are times when declining to do something is much better for us than saying yes. 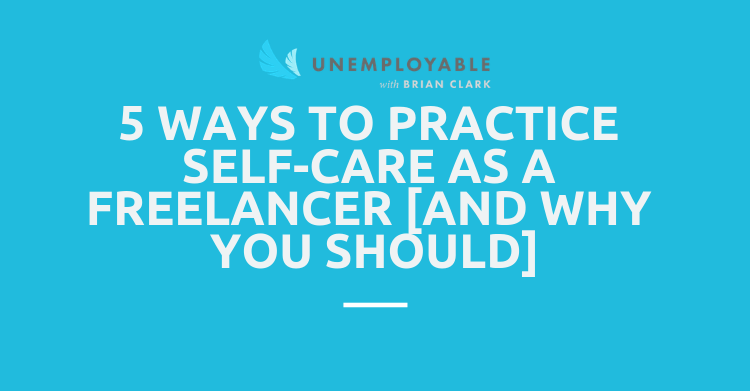 During some point in your freelancing career or throughout other aspects of your life, you’ve likely said yes to an opportunity even though it wasn’t your specialty, you had too much on your plate, or you just weren’t interested. There are many reasons why we say yes to the things we don’t want to do. People pleasing, fear of the repercussions of saying no, money matters—the list goes on and on. But when we say yes to things we don’t want to be doing, we fill our lives with things that others want us to do instead of what we want to do. Saying no to something doesn’t mean we’re bad people or that we’re selfish. It means that you’re saving space in your life for things you care about that make you happy or get you excited to be part of. So the next time an opportunity drops in your lap and you’re not interested, politely decline and move on with your life. Letting your body recharge is one of the best things you can do for yourself in terms of self-care. In fact, adults between the ages of 26 and 64 need around 7 to 9 hours of sleep each night. Sounds like a recipe for an unproductive day, right? Bottom line: Your body needs sleep to repair itself and keep you healthy and functioning. It’ll be difficult to carry on if your body isn’t physically capable to do so. Do whatever you have to do to help yourself not only get the right amount of sleep but that you’re getting quality sleep, too. Winding down and prepping for a good night’s sleep means ditching our screens for some quiet relaxation instead. Think about your current nighttime routine. Are you glued to your phone right before you turn out the light (or even after the light has gone out)? Are you watching tons of TV right before you go to bed? Instead of watching another episode on Netflix or catching up on Twitter, try reading or meditating before your head hits the pillow. Create a bedtime routine that calms your mind and body, and that paves the way for a solid slumber. Integrating self-care practices into your daily life doesn’t mean you suddenly have to make a ton of changes. It merely means listening to your body and mind and stepping away from the keyboard to fit more “life” into your life. Read a chapter of a book before bed instead of watching TV. Go for a 15-minute walk right when you wake up rather than reaching for your phone. Whatever you decide to do, make your self-care a priority. Your body and your mind will thank you, and you may find that you experience a bit more happiness and joy in your days. Want more ways to elevate your freelance career? Tune into the Unemployable podcast for more.